Alvia Madrid-Hendaye (RENFE Class 130) at Valdestillas, Valladolid. 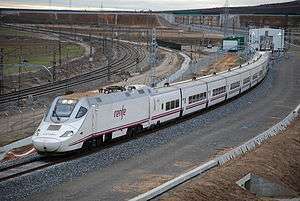 Alvia is a high-speed train in Spain used by Renfe Operadora for long-distance service with a top speed of 250 km/h. The trains have the ability to use both Iberian gauge and standard gauge, which allows them to travel on the recently constructed high-speed lines for part of the journey before switching to the ″classic″ Iberian gauge network to complete it. Trains that run exclusively on high-speed tracks are branded AVE or Avant. Mixed-high speed services via conventional lines in Spain. Sections over High-speed railway lines in blue, sections over conventional line (in Iberian gauge) in red). As of March 2009, RENFE Class 120 and RENFE Class 130 trains are in service. 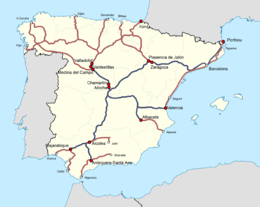 Class 120 trains are used on the routes from Madrid to Pamplona, Logroño, Irún, and Hendaye (running on high-speed lines from Madrid to Valladolid and changing gauge there), and between Barcelona and Vigo, Irún, Bilbao (running on high-speed lines between Barcelona and Zaragoza). Class 130 trains are employed on the routes from Madrid to Alicante (on high-speed lines from Madrid to Valencia), and to Gijón, Santander, Bilbao, Irún, and Hendaye (France) changing gauge at Valladolid, León and Venta de Baños. On 24 July 2013, an Alvia 730 train travelling to Ferrol, Galicia, from Madrid took a curve well above the posted speed limit, and derailed near Santiago de Compostela killing 79 people and injuring more than 140. ↑ Rodrigo Silva; Antonio Alonso (25 July 2013). "Accidente ferroviario en Santiago de Compostela" [Railway accident in Santiago de Compostela]. El País (in Spanish). Madrid. Event occurs at 00:02 CET. Retrieved 25 July 2013.